Heat oven to 450°F. Make pie crust as directed on box for One-Crust Baked Shell using 9-inch glass pie pan. Bake 9 to 11 minutes or until light golden brown. Cool completely, about 30 minutes. In 2-quart saucepan, mix sugar, cornstarch and flour. Gradually stir in water until smooth. Cook over medium heat, stirring constantly, until mixture boils. Reduce heat to low; cook 2 minutes, stirring constantly. Remove from heat. Stir about 1/4 cup hot mixture into egg yolks until well blended. Stir egg yolk mixture into mixture in saucepan. Cook over low heat, stirring constantly, until mixture boils. Cook 2 minutes, stirring constantly. Remove from heat. Stir in butter, lemon peel and lemon juice. Place 1/3 cup hot filling in 1-quart saucepan; cool remaining lemon mixture 15 minutes. Stir vanilla chips into hot filling in 1-quart saucepan; cook and stir over low heat just until chips are melted. In small bowl with electric mixer, beat cream cheese on medium speed until fluffy. Beat in melted vanilla chip mixture until well blended. Spread in bottom of cooled baked shell. 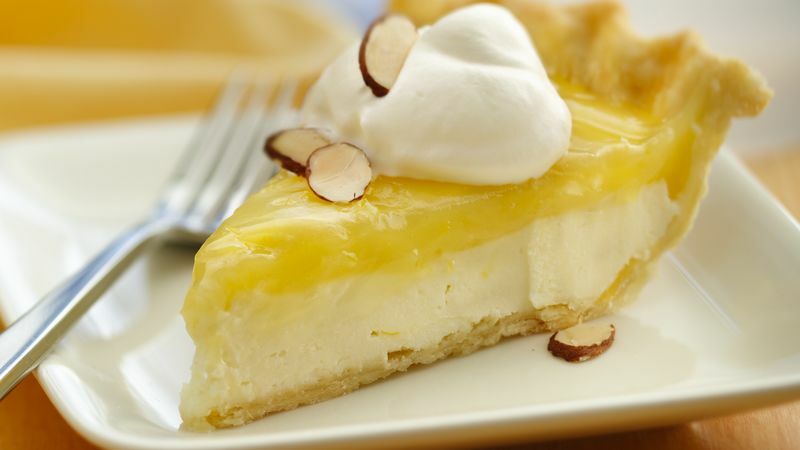 Spoon lemon mixture evenly over cream cheese layer. Refrigerate until set, 2 to 3 hours. In another small bowl with electric mixer, beat whipping cream on high speed until stiff peaks form. Pipe or spoon whipped cream over pie. Garnish with toasted almonds. Store in refrigerator. *To toast almonds, spread on cookie sheet; bake at 350°F 5 to 7 minutes, stirring occasionally, until golden brown. Or spread almonds in thin layer in microwavable pie pan; microwave on High 4 to 7 minutes, stirring frequently, until golden brown.